Wear jeans that fit! Yes, go out and buy a pair of jeans that fit you right now. There is no worse feeling than squeezing into jeans that are too tight. You deserve jeans that fit! I don’t know about you, but I was not one of those women that fit back into their pre-pregnancy jeans 2 weeks after giving birth. I did eventually get there after having my first baby…but it took a good 9 months. Nine months to gain it, nine months to slowly lose it. 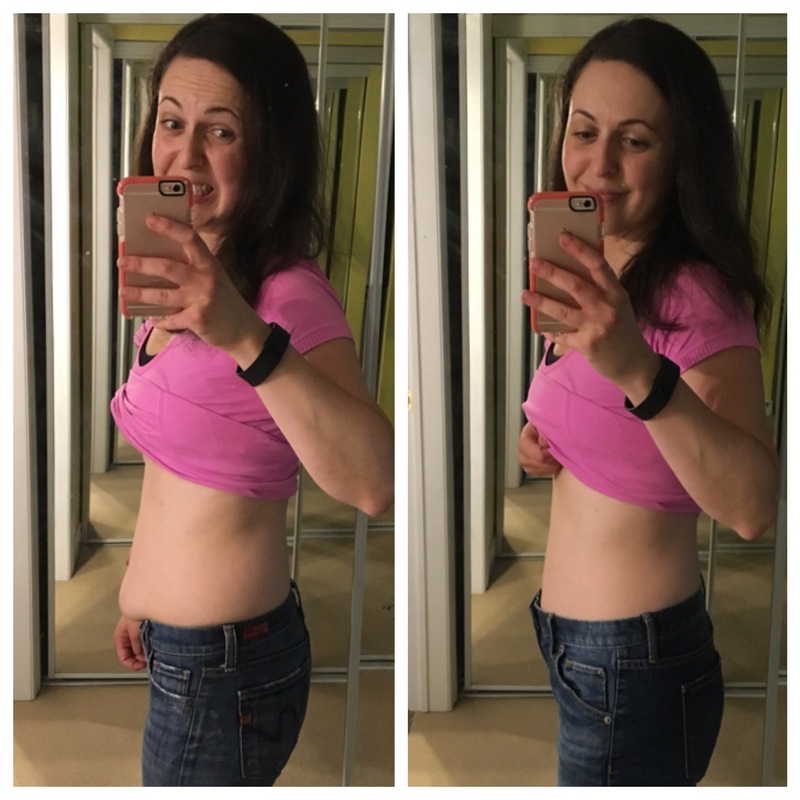 After my second and third – well those pre-pregnancy jeans just don’t fit any more. Things have shifted. I have some extra skin. Some extra fat cells on my tummy. And you know what? I’m ok with that. I bought new jeans!!!!!!! I’m in the best shape of my life right now. I workout almost every single day. Not because I want to fit back into my jeans, but because I truly love how my workouts make me FEEL! I can run 10k, I can lift heavy weights. I can do yoga and a killer spin class. I eat healthy MOST of the time, not because I want to fit back into my jeans but because I love how healthy food makes me feel. I will admit that I also love how dessert tastes so I have some now and then in moderation. Same with pizza. I feel like I am at a very balanced place in my life. I’ve been much more strict with my diet at times but I’m at a happy medium right now. I’m happy. And when I’m happy I’m a nicer person and that has a ripple effect on my kids and everyone else around us. I know I am a health and fitness coach and I am supposed to tell your how to carve out your abs and fit into old clothes again. I can help you with that if that is truly what you want. But I think most of us are after a feeling – a feeling of vitality, energy, happiness, peace and contentment. At least that is how I want to feel. And my lifestyle right now brings that to me. I’m putting together my next 21 day health and fitness challenge. We start February 29th. If you have been wanting to start taking better care of yourself – this is the perfect opportunity! Join my supportive community of women who help each other on their journies towards better health. Be a part of our group – work out everyday for 30 mins from the comfort of your home, learn about portion controlled clean eating and enrich your mind, body and spirit! If you want more info, please shoot me an email at sheryl@ikor.com or PM me via Facebook and I will get back to you ASAP with the details about the challenge.